Ontrol was exhibiting at the Niagara Forum Sunday, 26 March 2017 – Tuesday, 28 March 2017 at the Park Plaza Westminster in London. The Niagara Forum is a place to learn what truly open systems can achieve and how to make the most of the opportunities offered by the IoT. 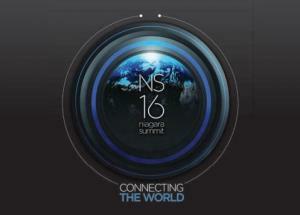 The Niagara Framework has the power to connect diverse devices and systems in ways that have never been imagined before. Whether you are designing for an office, hospital or data centre this truly open platform empowers users to achieve more than they thought possible. Make sure you download the new bundle to take advantage of several bug-fixes, new features and improvements. The six-day Light+Building show held in Frankfurt offered an opportunity for those companies developing Sedona Framework products to get together and explore if there was a need for a Sedona User’s Group. Attending companies were: EasyIO from Singapore, SysMik from Germany, Global Control 5 from Poland, Ontrol from Turkey and Contemporary Controls from the U.S. Bar-Tech from Australia could not attend but submitted a proposal for a Sedona API. The discussions were lively and it was clear that Sedona was important to the companies in attendance. More info on Contemporary Controls web-site. 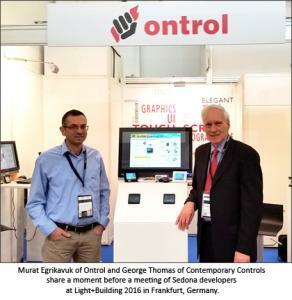 Ontrol was at at Light + Building, the world's leading trade fair for building services technology, which took place in Frankfurt in March 13-18, 2016. Ontrol was present in USA in two major events during June. First was the 2015 Mini Niagara Summit organized by Cochrane Supply.With over 300 attendees, the 2015 Niagara Mini Summit brought together manufacturers, integrators and end users from throughout the Midwest (Michigan, Ohio, Indiana, Kentucky) and Canada to explore the latest solutions available to Tridium's Niagara Framework community. Then we exhibited at the IBcon conference in San Antonio, Texas. IBcon is one of the world's most comprehensive and leading edge discussion on the next generation of smart, connected, high-performance, green, sustainable, intelligent buildings. As always, the R-ION color touchscreen programmable controller was very popular in both events. This year's Niagara Forum in London was a great event. 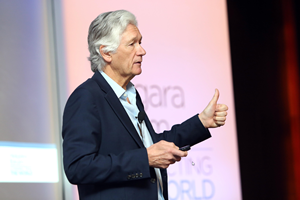 With 500+ attendees representing more than 200 companies from 29 countries, it was the largest-ever gathering of the Niagara Community in Europe. 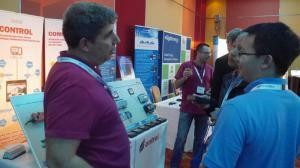 Ontrol was present as a Gold Sponsor and exhibitor. 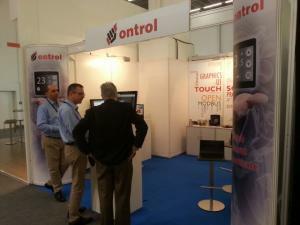 Thre was a huge amount of interest with our R-ION color touch screen room controller, as well as other products. The DALI port on the R-ION programmable touch-screen Sedona controller is now available. DALI (Digital Addressable Lighting Interface) is a global IEC 62386 communications standard for intelligent light fittings. The driver allows sending commands to any DALI compatible control gear. These include on, off, step-up, step-down etc., as well as scene select commands and direct level control. The R-ION can also query Dali devices for status and actual value. A bus power supply is already built in (13mA max), so in most single-room applications, an external Dali bus power supply is not necessary. Ontrol was proud to be a sponsor of the Niagara Summit 2014 held at The Cosmopolitan of Las Vegas in April 27-29, 2014. The Niagara Summit is where the Niagara community comes together to exchange ideas, make connections, gain valuable insight into industry trends and help shape the future of the Niagara platform. This bi-annual event gives developers, programmers, building owners, engineers and executives a chance to sit down in the same room and share their thoughts on device-to-enterprise applications and automation infrastructure. The Niagara Summit is all about conversation—with forums, presentations and breakout sessions providing opportunity for the community to weigh in. Nowhere will you find a more engaged, more galvanized community of Niagara devotees, working together to bring intelligence and connectivity to the network edge and back. Use this simple tool to speedily compute how many controllers/relay modules you need for any Input/Output requirements. 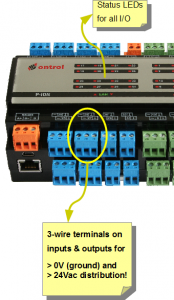 The flex I/O capability is an under-appreciated but great feature of the PION programmable controller. Use this tool and calculate for yourself how competitive the PION can really be against any alternative solution. Try it here. A Niagara driver for Grundfos pumps utilizing GENIbus is available from Ontrol. 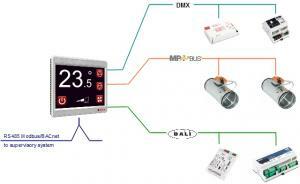 This can be used to connect Grundfos pumps to Building Management Systems and SCADA systems. 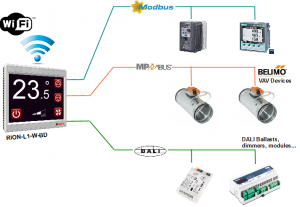 GENIbus is an open data communication protocol developed and maintained by Grundfos. 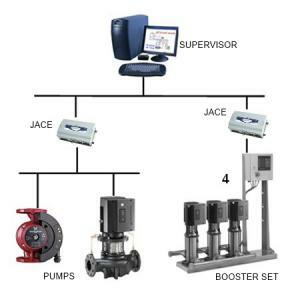 It has been optimized for pump control and monitoring, making it an ideal choice for implementing reliable communication in pumps. The driver enables comprehensive operational data to be retrieved by a supervisory system, including status, setpoints, control parameters, alarm and fault information.